I grew up in Wheaton, Ill., one of Chicago's western suburbs, and became a Cubs fan by default. All my friends were Cubs fans, my dad took us to Wrigley for games (never Comiskey! 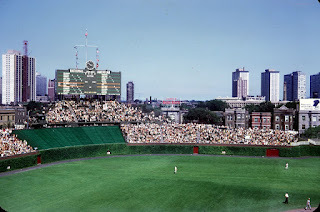 ), and the Cubs games were televised on channel 9 while the White Sox were usually on a UHF channel (44) that was hard to tune in (if you remember wiggling a dial to get your grainy local UHF signals, you are old like me). 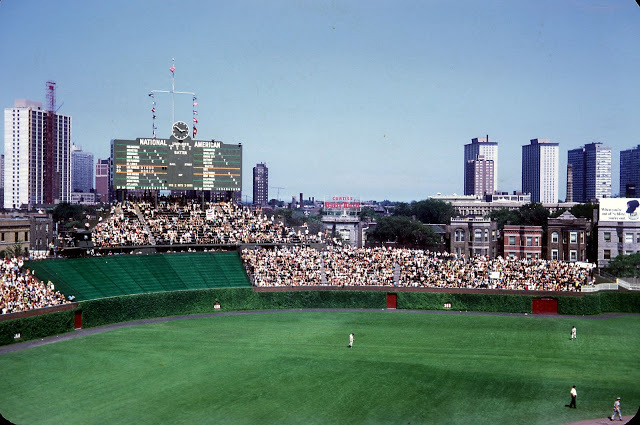 This photo is from a game I attended in 1969 with my family. That year, and every year since 1945, ended the same way: with the Cubs failing to win the NL pennant. So last night's victory is a gigantic step forward for the Cubs, who will now play Cleveland in the World Series. By now you're asking, “yes, but that's a game and this blog is about infection prevention, what's the connection”? I think you can interpret this quote in two ways, each of which applies to infection prevention. First, he may have meant to say “avoid being outcome-focused.” In other words, stop wasting energy worrying about your outcomes, instead put your energy into the processes that you know will, eventually, move the outcome in a favorable direction. This is becoming increasingly difficult in infection prevention as Centers for Medicare and Medicaid Services pay-for-performance programs put more and more pressure on rates. The temptation is to put time and energy into activities that might impact the outcome quickly but without doing anything to improve the safety of patients (gaming the definitions, empiric treatment approaches, changing lab practice). Counterproductive, and in many cases also bad for patients. Alternatively, he could have been literally referring to “outcome bias,” which is an error in evaluating the quality of a decision, or the effectiveness of a practice, when the outcome is already known. This might lead one to deviate from an effective practice because a bad outcome occurred in the past when the practice was in place, or to institute a dubious practice because prior implementation was coincident with a favorable outcome. This ignores the fact that outcomes are often influenced by a myriad of factors, many of which are not understood or not under the decision-maker's control. The infection prevention take-home from either interpretation? Focus on those practices that have been demonstrated to improve outcomes—keep your eye on the process and the outcomes will follow. Avoid gimmicks that might move the outcome needle but for which no evidence exists that patients will benefit.